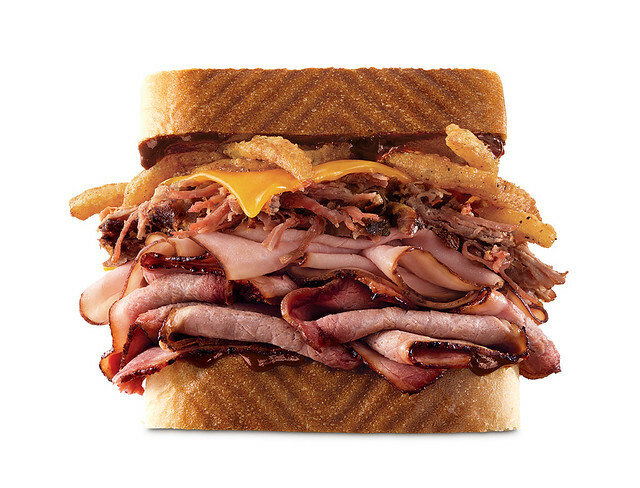 Arby’s craveable Smokehouse platform is adding a host of heavy-hitters for a limited time: the Beef Short Rib Sandwich, the Beef Short Rib Loaded Curly Fries and the monstrous Smoke Mountain. Mesquite-smoked for at least six hours, the Beef Short Rib Sandwich features pulled smoked beef short rib, melted cheddar cheese, crispy onions and a smoky BBQ sauce on Texas Toast. The Beef Short Rib Loaded Curly Fries starts with a base of Arby’s famous Curly Fries, topped by smoked beef short rib and covered with melted cheddar cheese, crispy onions and smoky BBQ sauce. The mighty Smoke Mountain is piled high with 13-hour smoked brisket, pulled smoked beef short rib and pit-smoked ham – all paired with melted cheddar cheese, crispy onions and smoky BBQ sauce on Texas Toast. Arby’s Beef Short Rib Sandwich, Beef Short Rib Loaded Curly Fries and Smoke Mountain are available nationwide for a limited time.